KATHMANDU, March 18: Nepal has pressed for earliest and effective implementation of the Memorandum of Understanding (MoU) reached with Malaysia in October last year for supply of Nepali workers to Malaysia. 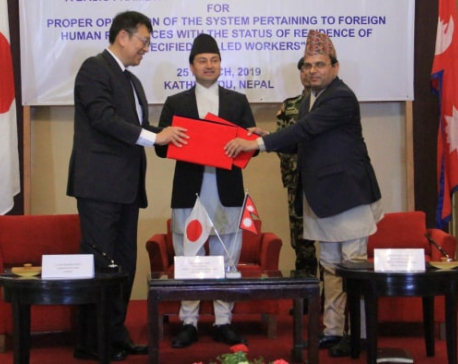 The bilateral labor pact was signed covering areas as recruitment, employment and repatriation of workers. According to a press statement released by the Nepali embassy in Malaysia, Nepali ambassador to Malaysia Udayaraj Pandey urged Malaysia for the same in a meeting with Deputy Director General at the Ministry of Foreign Affairs in Malaysia Raja Dato’ Nurshirwan Bin Zainal Abidin in Malaysia today. The newly inked labor pact is in the best interest of the Nepali migrant workers aspiring to work in Malaysia. According to the pact, the Nepali migrant workers to Malaysia are not subjected to paying any fees for the job in the South-East Asian nation. 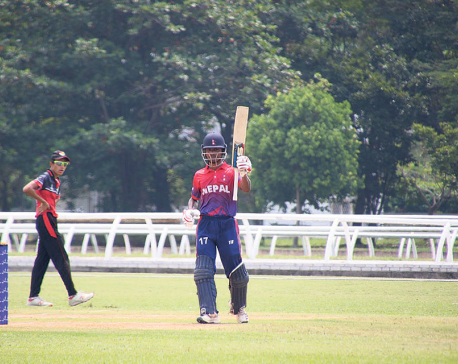 Furthermore, the employers will be responsible to bear all the expenses on behalf of the Nepali migrant workers including recruitment service charge, two-way tickets, visa fee, medical check-up and security screening of the worker. “If the Malaysian government is to forward the work at the earliest in line with the new criteria for the medical check-up of the migrant workers, Nepali migrant workers in Malaysia would feel some respite,” reads the press statement. During the meeting, the Nepali envoy requested the Malaysian entrepreneurs for their encouraging participation in the upcoming investment summit scheduled to be held in Kathmandu from March 29-30.